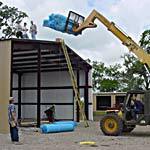 Bay Insulation, our key insulation supplier, is the country's largest supplier of flexible glass fiber blanket insulation for metal buildings. They offer custom lamination to a variety of facing materials. Each roll is individually tagged to identify its intended location in the building roof or walls. * R-16 (5") is a non-standard item. Un-faced glass fiber blankets are designed for use as additional insulation for faced blankets, fiberglass or foam boards, or retrofit applications. Filler blankets are available in standard widths between 36 and 96 inches.